Announcing New Preschool Open Gym Time!!!! *Participants for all Open Gyms will need a waiver on file. You can download one here: waiver. Stop in the day of open gym and check-in at the check-in station inside of the gym doors. Parents can drop their children (4+) off. All children will need a waiver signed and parents are to stay with their children 4 and under the entire time in the gym. There are spaces available for storing your belongings in lobby. All shoes are to be kept in the lobby. Any mats that are taken out for your use will need to be returned to where you find them by the end of the open gym. We ask that all parents arrive 10 minutes prior to the end of open gym so that children are not left waiting at the end of the night. Stop in the day of open gym and check-in at the check-in station inside of the gym doors. Parents will sign-in and pay at the check-in station. All children will need a waiver signed and parents are to stay with their children the entire time in the gym. There are spaces available for storing your belongings in lobby. All shoes are to be kept in the lobby. Any mats that are taken out for your use will need to be returned to where you find them by the end of the open gym. Only one participant is allowed on the white trampoline at a time. If you are assisting your little ones on the tramp, try to avoid any bouncing/jumping yourself as it is a hazard for your child. Kids should be taught to keep their arms by their sides when landing on their bottoms, not behind them. No jumping off of the trampoline onto the floor, from the trampoline into the pit or on to the orange trampoline surrounds. Never jump into the pit in an area near other participants. Please encourage kids to look before they jump in to the pit, not crossing direction with others. Always land on feet, bottom or backs. Please never land on heads or stomach. Be aware of the direction others are entering the pit from in all areas. Please do not use the rope during open gym times to prevent collision. When swinging on bars do not let go while upside down. Always attempt to land on your feet. Please do not use the high bars during open gym for your safety and the safety of all of those around you. Only one participant is allowed on the bars at a time. Please do not walk in front of someone that is swinging on the bars to prevent a collision. There is no use of rings during open gym. Land on feet only when jumping off the balance beam. Avoid putting arms out to “catch” the landing from the beam. Beams are only to be used if the participant can get on and off themselves. Participants are to treat everyone with respect, including the coaches. No shoes or food inside the gym. Participants are to dress appropriately in clothes that are easy to move in. Participants are to treat the equipment and mats with respect and stay off of all of the exercise equipment including the exercise bike, elliptical, medicine and workout balls. Please no use of the trench or trench bar during open gyms. Please do not stand on the mats covering the trench. No cell phones in the gym to avoid them getting lost. Participants are not to run in front of others. Participants are to put any mats that are taken out back where they were originally found. Participants are not go upstairs, behind the handstand wall, in the locker room or in the back offices. Foam is to stay in the pit. No adults on the equipment. No uses of the preschool toys permitted. There is no leaving the gym or building without permission from a coach the safety of all participants. **If rules are not followed, the coaches may send a child out, contact the parents or ask them to leave. There will be no refunds for inappropriate behavior. We expect good behavior from all of our open gym participants so that no one gets hurt and everyone has FUN! 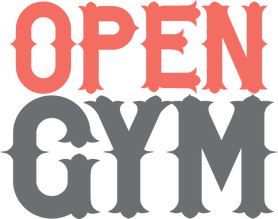 Please check our calendar of events for open gym closings.